The Global Fund is making some changes to how it measures and reports impact and results. For most indicators, the Fund will report annual increases instead of cumulative results. The new methodology includes an increased focus on national-level results, and some new indicators are being added. The 2017 results report, which will be released on 12 September 2018, will be based on the revised methodology. 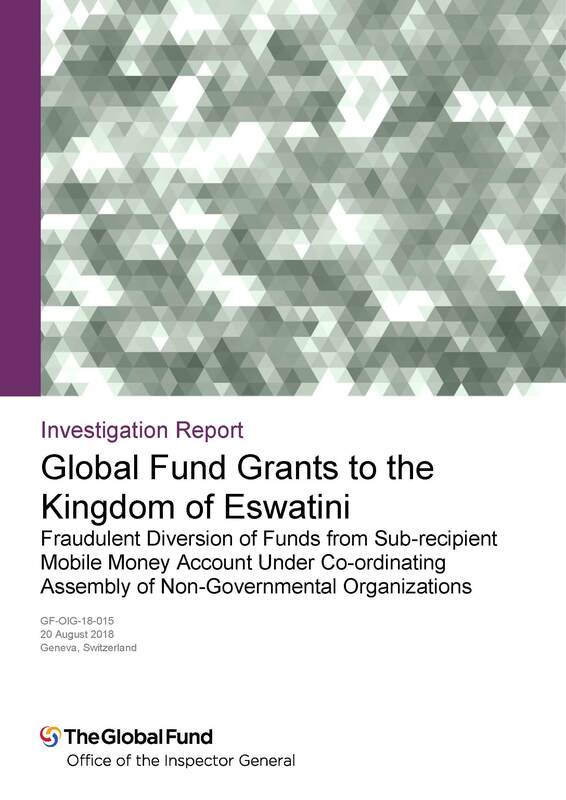 The Office of the Inspector General has published three reports detailing its investigations into various types of misuse of funds and non-compliant expenditures within Global Fund grants in Nigeria, Eswatini, and Papua New Guinea. This article summarizes the reports, highlighting their main findings. Aidspan is taking a deeper look at the Global Fund’s different innovative financing instruments over a series of three articles, following the Global Fund’s opening of a formal consultation process earlier this year to develop a more structured approach to innovative finance within the organization. This third article describes innovation and cost-reduction incentive mechanisms and discusses the pros and cons of instruments, such as challenge funds, advance market commitments and seed funding. In a 'proactive' investigation, the Office of the Inspector General uncovered some deficiencies in the Global Fund’s processes for procuring HIV rapid diagnostic test kits, between 2014 and early 2017, in eight countries including Georgia, South Africa and Uzbekistan. The focus of the investigation was on the Global Fund's quality assurance processes, not the Principal Recipients. The Kenya Medical Supplies Authority (KEMSA) is the government body authorized to procure and distribute Global Fund-supported health commodities. KEMSA obtains competitive prices compared to the Global Fund’s Pooled Procurement Mechanism, stock-outs of health commodities happen rarely, and orders are delivered on time. This article shows how – in some cases – a country’s independent procurement, if well managed, can work as well as the Fund’s pooled procurement. Aidspan's GFO presents a curated catalogue of some of the most useful and interesting resources and articles emanating from the International AIDS Conference in Amsterdam this past July. Included is web content from the Global Fund, UNAIDS, and WHO, as well as core conference resources from the International AIDS Society. Other articles and resources come from civil society, news organizations, and social media. Between 10 July and 20 August 2018, the Office of the Inspector General (OIG) released reports on three different investigations into Global Fund grants in Papua New Guinea, Nigeria, and the Kingdom of Eswatini (formerly known as Swaziland). The OIG identified $175,818 in fraudulent and non-compliant expenditures in Papua New Guinea; $51,038 in misappropriated funds from the salaries and allowances of Global Fund grant employees in Nigeria; and $26,701 fraudulent diversion of funds from sub-recipient mobile money accounts in Eswatini. This article summarizes the OIG’s findings for each of these, in separate sections below. 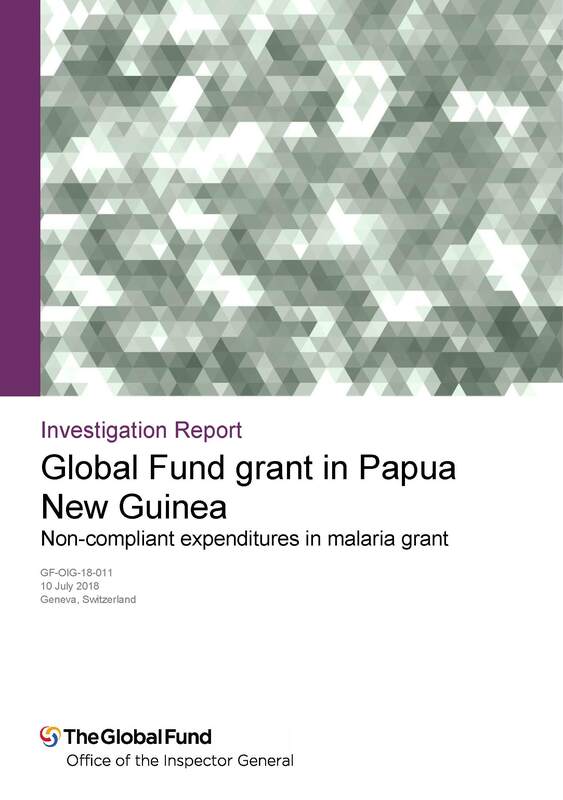 What happened: Population Services International, a Principal Recipient in Papua New Guinea, had previously identified fraudulent and non-compliant expenditures in a Global Fund Round 8 malaria grant totaling $551,608. An amount of $195,447 was identified in PSI’s initial investigation using an external auditor in 2015, and an additional amount of $356,161 was identified in 2016 during an additional review by PSI of the same grant. In 2017, PSI’s external auditor issued a ‘disclaimer of opinion,’ informing the Secretariat that they couldn’t obtain sufficient evidence to provide a basis for an audit opinion for direct expenses of US$4.3 million charged by PSI to the Round 8 malaria grant, in the same time period (1 January 2014 to 31 March 2015). PSI and the external auditor had not previously reviewed most of this amount. Based on the external auditor’s opinion, the OIG ran its own investigation into these expenses (4,098 transactions totalling $4,187,987, rounded to $4.2 million in most of the OIG’s report), and found a further $175,818 in non-compliant expenditures in the same grant, from these previously unreviewed expenditures. The wrongdoing was defined as ‘non-compliance with the grant agreement’ as the OIG was unable to determine whether they were fraudulent due to an absence of supporting documents. How it happened: PSI established that its National Finance Manager in PNG had committed the fraud, and that weak financial controls in its PNG office had further facilitated it. (PSI has since strengthened local financial controls.) The investigation found that weaknesses in PSI’s accounting processes had prevented earlier identification of the fraud, and that these weaknesses “continue to constrain financial assurance across all PSI’s Global Fund grants”. Origins of the OIG investigation: In July 2015, the OIG received its first alert of the wrong doing from the Secretariat, relating to fraudulent expenditures identified in July-August 2015 by PSI’s Global Internal Audit (GIA). The GIA conducted an additional review in early 2016, but did not communicate to the OIG of the results of this review at the time. GIA informed the OIG in April 2017 that the 2016 review had identified further unsupported expenditures totaling $356,161 in the Round 8 grant. Based on external audit findings provided to the OIG by the Secretariat in January 2017, the OIG opened its own investigation into the Round 8 malaria grant. Actions already taken: PSI has refunded to the Global Fund the full amount of $551,608 from fraudulent expenditures identified by PSI’s own investigations in 2015 and 2016, as well as the $175,818 later identified by the OIG as non-compliant expenditures from the same grant. In addition, PSI has taken steps to improve internal controls in its PNG office, including clearer definition of roles and responsibilities, and enhancing oversight, monitoring and verification of grant expenditures. Given the finding that the weaknesses identified in PSI’s PNG office exist across all PSI’s Global Fund grants, the Secretariat is working with PSI to improve PSI’s financial assurance processes globally, including how PSI’s revised control procedures will be harmonized across all the Global Fund grants it manages. Country context: The Global Fund currently has two active grants in PNG, with a combined commitment of $36.3 million, of which $20.6 million has been disbursed. Papua New Guinea is classified as a ‘Core’ Global Fund country (large portfolios, higher desease burden, higher risk). What happened:The national coordinator of the Civil Society for the Eradication of Tuberculosis in Nigeria (TB Network), a sub-recipient of Global Fund grants in Nigeria, orchestrated a scheme to misappropriate funds amounting to $51,038 from salaries and allowances paid to other TB Network employees over a 14-month period. The National Coordinator was assisted by the former Finance Manager and a program Internal Auditor, the OIG found, in running the fraudulent ‘scheme’. The TB Network management were also found to have colluded to misappropriate an additional $10,750 from Global Fund grant salary disbursements, by authorizing salary payments to five network employees over a two-month period (July to August 2016), before these employees began their jobs at the network in September 2016. These employees went on to pay the majority of these funds into the ‘scheme’. The misappropriation of funds took place between July 2016 and September 2017. Further, between July 2015 and December 2017, the TB Network sublet a portion of its office to a third-party entity, and did not report the sublet nor the $9,108 in income generated by it to the Principal Recipient, which supported the full cost of the TB Network’s rental of the premises. 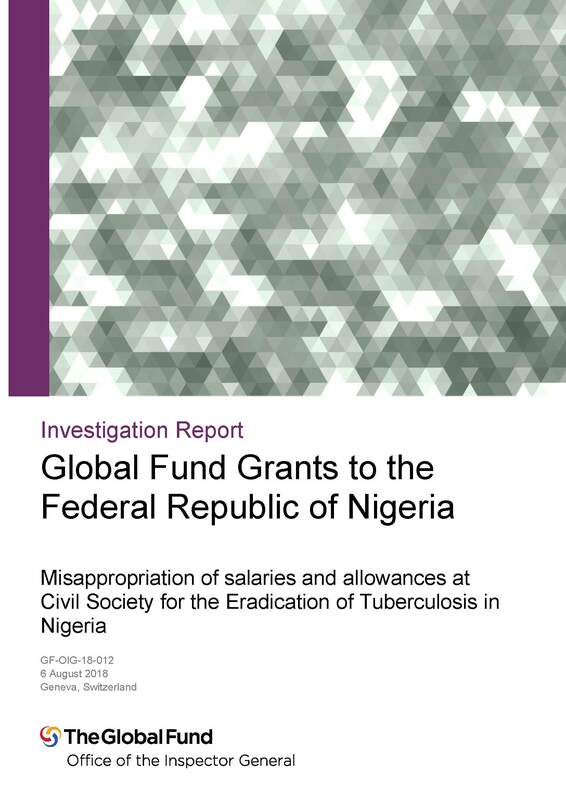 In addition, in February 2017, one of the Global Fund’s Principal Recipients that funds the TB Network’s activities, the Institute of Human Virology Nigeria, received information about the ‘mandatory’ salary and daily allowance deductions imposed on the network’s employees. The institute, however, did not report this information to the Global Fund, in breach of its obligations to report to the Global Fund any such concerns that affect or involve the integrity of Global Fund resources. Overall, the OIG identified four types of wrongdoing associated with its finding of non-compliant expenditure totaling $63,580: coercion, collusion, fraud, and non-compliance with grant agreement. How it happened: The network’s management team required employees working on Global Fund programs to pay 30 percent of their monthly salary and 10 percent of their daily subsistence allowances (DSA) into a scheme that was supposed to help finance the organization’s running costs as well as the salaries of some junior staff not paid by the Global Fund grant. The investigation found that while the deductions were supposedly voluntary, the TB Network’s management presented these contributions as mandatory, with the result that some employees said they had feared they might lose their jobs if they refused to make the payments. The network management said that the funds employees had contributed were for the ‘sustainability of the organization, including for payments to office support staff, low-paid program employees and for office ‘running costs’. While some of the ‘voluntary’ deductions did go towards meeting these expenses, the three TB Network management staff responsible for organizing and running the fraud pocketed 45% of the funds collected. Origins of the OIG investigation: In July 2017, the OIG was informed by a whistleblower about an alleged mandatory salary and DSA deduction scheme run by the management of the Civil Society for the Eradication of Tuberculosis in Nigeria (the TB Network). The information given to the OIG suggested that the scheme had been operating since July 2016. The OIG carried out an investigative mission to Nigeria in October 2017, looking at the period from July 2016 to September 2017. Actions to be taken: The OIG proposes recovering the total amount of non-compliant expenditures. Country context: The Global Fund has nine active grants in Nigeria, with a total commitment of $1.2 billion across the three diseases, of which $1.1 billion has been disbursed. Since its first grant to Nigeria in 2003, the Global Fund has disbursed $2 billion in total, making it one of the Global Fund’s biggest investments. Nigeria is classified as a ‘high impact’ Global Fund country (very large portfolio, mission-critical disease burden) as well as a ‘challenging operating environment’ which has additional safeguard policies. What happened: In 2017, two external audits identified financial irregularities at the Family Life Association of Swaziland (FLAS), a Global Fund Sub-recipient, between 1 April 2016 and 31 March 2017. The results of these audits were communicated to the Principal Recipient, the Co-ordinating Assembly of Non-Governmental Organizations (CANGO). The OIG subsequently investigated programs implemented by FLAS within the CANGO HIV/TB grant. The investigation found that FLAS’s Project Finance Officer fraudulently diverted SLZ 370,330 ($26,701) of Global Fund grant funds, between 1 June 2016 and 30 April 2017 (the period in which the mobile money system was operating) by making improper transfers through FLAS’s mobile money account into his own personal account as well as to other unauthorized accounts. Some of the funds that went into his personal account ($6,081, or 17 percent) were used to make payments – outside the grant program – to community facilitators, outreach workers, trainers, and other beneficiaries who had no formal contracts with FLAS; these payments were therefore deemed non-compliant. The vast majority of these funds ($20,620) was used by the Finance Officer for personal reasons. How it happened: The OIG report says that this fraud happened because of both insufficient supervision by FLAS management and lack of segregation of duties (the mobile money account was managed and operated only by the Project Finance Office) and management’s lack of understanding of available controls to safeguard transactions made through the mobile money system. At the Principal Recipient level, the OIG report stated, the reporting structure was disorganized and there were not enough staff to monitor FLAS’s activities effectively. In addition, CANGO did not require from FLAS – nor create itself – a standard operating procedure according to which the mobile money system was to be managed and operated. The result was ineffective controls and opportunities missed to detect the Project Finance Officer’s fraudulent actions. Mobile money technology was successfully introduced in Africa as part of a mass bed net distribution campaign in 2016. The Global Fund supports the increase in the use of this technology, recognizing its potential value to improve financial management and decrease fraud, theft, and corruption. FLAS implements (under the guidance of CANGO) the Stepping Stones program for HIV awareness and education in 149 communities across Eswatini, employing 149 community facilitators and 20 volunteers responsible for establishing peer groups of 15-20 participants. The community facilitators are paid monthly stipends of SZL 1,500 ($108) through the mobile money system, to recruit participants. Participants receive incentives in the form of prepaid airtime. Of a total of SZL 7,825,048 ($564,187) transferred from FLAS’s mobile money account between 1 June 2016 and 30 April 2017, 91.8 percent of the funds ($517,930) were deemed to have been properly distributed – using the mobile money system – to the facilitators, volunteers, grant program beneficiaries, and other FLAS employees executing grant activities. Overall, the OIG found SZL 370,330 ($26,701) in non-compliant expenditures at FLAS, including $4,590 representing transfers to community facilitators, outreach workers, trainers, and other beneficiaries who had no formal contracts with FLAS. The OIG identifies the full $26,701 as potentially recoverable. The OIG identified two types of wrongdoing, namely fraud and non-compliance with the grant agreement. Origins of the OIG investigation: The Global Fund Secretariat alerted the OIG of the potential misuse of grant funds by FLAS. An annual external audit report of CANGO covering 1 April 2016 to 31 March 2017 identified “financial irregularities” amounting to SZL 594,554 ($42,867) attributed to “questionable transactions” from FLAS’s mobile money account. A second forensic audit confirmed these findings. The OIG’s investigation covered only the period during which FLAS’s mobile money system operated, from 1 June 2016 to 30 April 2017. Actions taken: On 16 June 2017, after initial concerns were raised by an external audit report, FLAS suspended the Project Finance Officer without pay. A subsequent forensic audit substantiated those concerns, and the officer was dismissed, effective 15 September 2017. From December 2017, CANGO took over the management of FLAS’s mobile money account and has full responsibility for all financial transfers related to Global Fund programs. This means that CANGO now pays – through the mobile money account – stipends for community facilitators, outreach workers, and peer educators. CANGO also manages the FLAS ‘virtual top-up’ (VTU) account to transfer incentives to program participants in the form of pre-paid mobile phone minutes. A backlog of incentives for participants, to be paid through the mobile money account, dated back to May 2017; the Secretariat had conditioned the use of $187,000 for participant stipends until the completion in June 2018 by the Local Fund Agent of its verification of previous transactions on the mobile money account. Country context: The Global Fund supports six active grants in Eswatini across the three diseases, with a total investment to date totalling $248,608,558. CANGO is one of the two Principal Recipients in Eswatini, and is the PR for the Global Fund HIV grants. The CANGO HIV/TB grant amount is $6,308,560, of which $6,192,244 has been disbursed; the grant runs until September 2018.